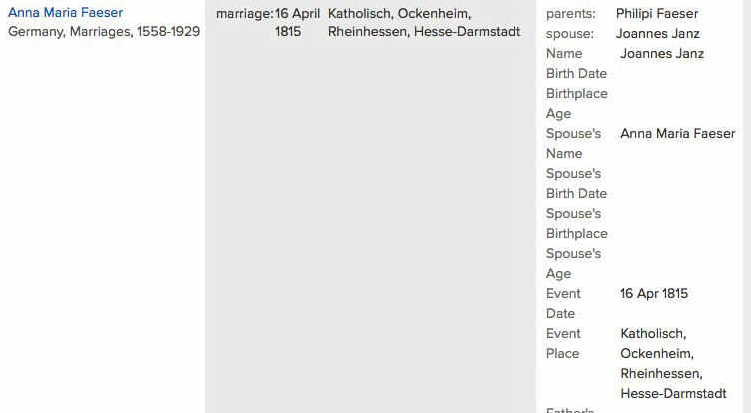 Today we celebrate the marriage of my 3rd great-grandparents, Anna Mariae Faeser and Johannes Janz. The joined in the Roman Catholic Church in Ockenheim, Rheinhessen, Hesse-Darmstadt on 16 April 1815. As you can see, there was a long string of Anna Maria in this branch of the family tree. Oscar Aderman and Anna Maria Boerner Aderman’s four sons continued that tradition by having a daughter in each of those four families with a middle name of Ann.